The impressive Neil deGrasse Tyson onstage at the Lesher Center. Nothing personal, It isn’t you. It’s just that the universe is so immense, more immense than we can imagine. I thought I at least had an idea about it, but then we went to hear Neil deGrasse Tyson speak and I’m feeling very small. 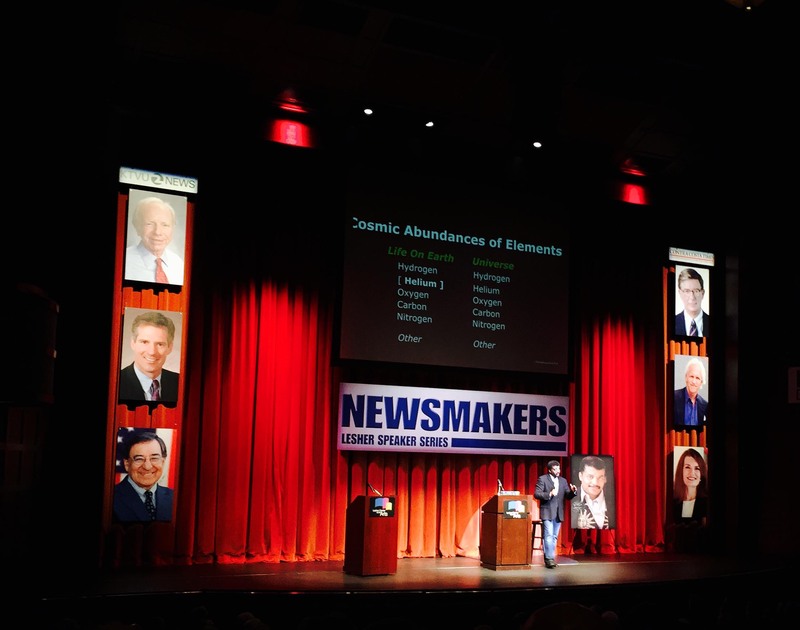 The Lesher Center has an excellent speaker program, which is sold out completely. How completely? Not only the 785 seat Hoffman (at $75), but also the 297 seat Lesher theater ($40), where they simulcast the lecture on a large screen. Fortunately for us, Micky and Linda are in Tahiti, so he gave me their tickets. I think he hopes I’ll get more educated. The show started on time, which is always a good sign. Dean Lesher’s son, Steve, came out for a bit to welcome the crowd. Then, for some reason of formality I don’t understand, he introduced somebody who came out to introduce Dr. Tyson. This seems completely unnecessary to me, a waste of time, effort and whatever they had to pay the introducer. Not that anyone asked my advice. Then the famous guy himself took the stage, and things shifted into high gear. Tyson came out in pressed jeans, an open neck shirt and a sport coat. He’s completely at ease in front of people, warm, engaging and funny. Cosmos was on Fox TV. Riffing on Fox, Tyson pointed out that there are many Fox channels, and only Fox news is ostentatiously anti-science. Then followed over an hour and a quarter of well-scripted ramble through the sciences. Lots of slides where the “you are here” gets progressively smaller and we continue to see how tiny the Earth is, how vast the universe–if there is only one universe and not a multitude of them. After the body of the speech, he stood onstage and took questions from teh audience, showing a verbal nimbleness that equals his mastery of the subject. I haven’t been to a science lecture since early in college, and they were never this much fun. Getting to spend an evening listening to Dr. Neil deGrasse Tyson was a pleasure and a privilege. Now don’t bother me, I’ll be watching all of Cosmos on Netflix.